When I was a child I fell in love with animals by watching BBC and Nat Geo documentaries, and grew up dreaming of being a vet or a zookeeper à la Steve Irwin. Naturally, going on safari in Kenya was one of my few bucket-list dreams. As we drove down to Maasai Mara National Park the sky stretched and widened into a dome over the Great Rift Valley. In the two-odd hours that we drove the weather was restless. Sometimes the sun would shine so bright as to blind us, only to give way to a vengeful wind that spat sand in our faces through the tiniest wound-down slits of our van’s windows. At some point short bursts of rain drew out a musky scent from the earth, hinting at what we might soon see. Kenya’s Maasai Mara National Reserve is one of the most popular destinations in East Africa for observing wildlife, so when I made my first trip here as a volunteer, a safari in Kenya was definitely on my must-do list. Like chasing the Northern Lights, it’s an experience that truly lives up to the hype. Why go on safari in Kenya? If your goal is to see the Big Five game animals: the lion, leopard, rhinoceros, elephant, and Cape buffalo, then you can easily go on safari in other African countries. Botswana, Namibia, Zambia, and South Africa are some of the more popular destinations. What is unique to Kenya and neighboring Tanzania, however, are the resident Maasai people and the Great Migration throughout the Serengeti and Maasai Mara. Budget vs. luxury safaris: what’s the difference? Since I was traveling on a budget, I chose a 4-day group safari tour, which included a day and a half of actual game drives in the Mara and a morning game drive around Lake Nakuru. Bright and early in the morning I was, along with other guests, picked up in downtown Nairobi by a tall and soft-spoken man named Ben, who would serve as our driver and guide. If you’re trying to choose a safari operator, I recommend going for a KATO member tour company so you have some consumer protection and can also ensure that you’re supporting sustainable tourism in Kenya. I experienced a serious lapse in service with my budget tour company. Trust me – you get what you pay for. For a budget safari, I got to stay in a tented camp with a solid bed and high-pressure hot showers – more than enough comfort for me after a month of volunteering and bathing with buckets of cold water. Unfortunately, the camp wasn’t quite safe from one of the smallest but most aggressive attackers in the wild…ants. Several of the tents, including my own, were swarmed by the tiny pests and the camp staff’s attempts to curb their invasion simply didn’t work – they kept coming and I got bitten on my legs. Eventually I was moved to another tent and thankfully, the ants didn’t follow me. Well, such occurrences are to be expected when living amid nature! Unless you want a truly private safari in a luxury vehicle, most Kenya safari packages keep group sizes to a respectable 6-8 passengers per van (with pop-up roof). With my inability to spot animals, I definitely found it useful to have additional pairs of eyes on the lookout for lions, cheetahs, and leopards! When you’re out in the savanna, the differences between budget safaris and luxury ones tend to get camouflaged: by the layers of dust that cake each van and the fact that tour guides and drivers usually track and share hot sightings via two-way radio, so you’ll often find a half-dozen vans parked along the road watching a hunt. Whether you’ve paid $500 or $5,000 for your safari, you’ll get great opportunities to spot wildlife in action. To photograph them, however, you’ll need some decent camera gear and skills. More incredibly, these vehicles don’t have GPS. The drivers prattle back and forth in Swahili and in my case, Ben swerved and raced in all directions, sometimes in what seemed like circles and U-turns past streams and swaths of bush. For two days we revved over hills. We dived into creeks, scattering cliques of zebras. We stood with the roof popped open, then sat, then stood, because damn, our bums ached. Even with seven passengers keeping our eyes peeled, we were no match for Ben, who constantly pointed out things I could not see. “There, there’s a lion sleeping behind that rock,” he’d say, and all I’d see was…a rock. What I did see, though, was amazing. In the vast Serengeti the circle of life is laid bare. Babies are born, bleached skeletons litter the ground. Death for one is an extra day of life for another. Lake Nakuru National Park has a completely different environment compared to the Maasai Mara, and I found it to be a great reserve to visit since you can spot black and white rhinos (which were introduced into the park for protection) more easily here. Lake Nakuru is also renowned for the flocks of millions of flamingos that gather during nesting season. Apart from the fact that we were slightly off-season, Ben explained that due to pollution and agricultural development, the soda lake is becoming more acidic and flamingo numbers have dropped as the amount of algae which they feed on decreases. Instead, the birds are migrating to neighboring lakes. Since we’d still yet to spot any leopards or rhinos, poor Ben got badgered by us to seek them out in our last game drive. Round and round we went, checking every tree for signs of a leopard, but there were none to be found. Luckily, eventually…we found a white rhino! For a 4-day budget safari in Kenya covering only two wildlife reserves, I think catching four out of the Big Five isn’t too bad. 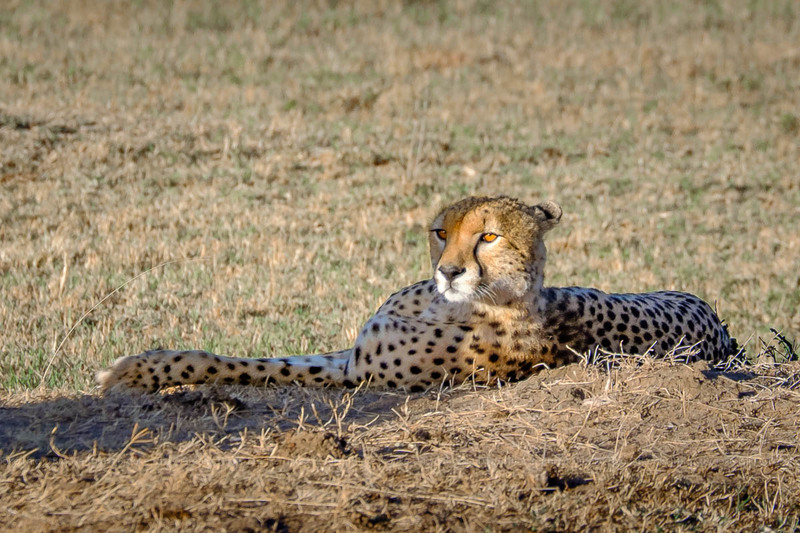 Are you ready to check the African wildlife safari off your bucket list? Here’s how you can do it in Kenya. The Maasai Mara is the Kenyan part of the Serengeti, one of the best places to observe lions and other wildlife in their natural habitat. Peak season is August-October, when the wildebeest cross the Mara River during their annual migration. Short on time? Try Nairobi National Park right on the edge of the capital city. Want to do your own driving/biking? Try Hell’s Gate National Park, which inspired the landscapes of Disney’s The Lion King. Some longer safaris cover both Kenya and Tanzania, but I’d advise against spending more than two days in the same park/reserve – it can get very dreary! How amazing it is to experience this, even to see the white rhino! I’m quite fascinated in animals and wanted to be a zoologist. I’d certainly would love to experience this – even though the ants may bite; ouch! that sounded a little painful? Ben have good eyes! Of course he’s very experienced, so it’s no surprise. Perhaps bringing a binocular is recommended? Yes, bring binoculars! Even better if you have a good camera with zoom/telephoto lens to take photos. Going on Safari is definitely on our travel wishlist. Your mention about ants had me cracking up. It reminded me of our trip to Zanzibar last year, and a few of my run-ins with the little buggers ;). Thanks for sharing the information on Lake Nakuru (such a shame). This looks incredible! It has always been my dream to see the Big Five. Your photos are gorgeous too- what kind of camera do you use? Once again a stunning documentation, Brooke! Great write-up, great photos! I laughed during the part when the guide pointed to the lion behind the rock and all you saw was a rock ^^ I’ll also love to see the living conditions of your accommodation for this Kenya safari trip! Wow I’d love to do this! I volunteered in South Africa on a game reserved and loved it. I’d love to visit Kenya too. What volunteering did you do there and with which company? It’s a shame you didn’t see the flock of flamingoes but how amazing that you saw a lion and her cubs! Loved reading your post. I saw your post on volunteering on a game reserve too! I was volunteering with a grassroots organization teaching IT skills, so it wasn’t conservation-related. I’d love to volunteer like you did but the programs I’ve found cost a lot (I understand the need to pay though).